From World Heritage rainforest to sparkling beaches, the Byron Bay region on the NSW North Coast is full of natural wonders. The Aboriginal Arakwal people call it Cavvanbah - the meeting place. The area is also famous for its surf culture, alternative philosophies, organic food and outdoor adventures. Byron Bay's natural attractions are impeccable - humpback whales cruise past the headland, dolphins frolic in the bay and storms create rainbows on the mountains. People from all walks of life meet here, drawn by Byron Bay's vibrant energy. Opening hours: Opening hours vary but most shops are open 9am - 5.30pm on weekdays and 9am - 12pm Saturdays with the major centres open until 5pm. On Sundays some bigger shopping centres are open from 10am - 4pm. Many of the bigger centres also have Thursday and Friday late night shopping until 9pm. 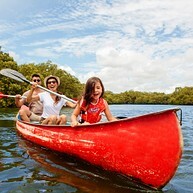 Byron Bay is a great place to get active, be it surfing, kayaking, sailing or swimming at a beautiful beach. Enjoy the thrill of skydiving and hand-gliding, and see a glorious sunrise from a hot-air balloon. Climb Mount Warning, an extinct volcano, and walk in World Heritage rainforest. Snorkelling and diving are popular, too. 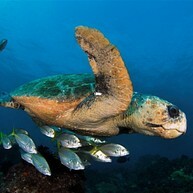 The reefs around Byron Bay are teeming with colourful fish, turtles and corals. Visit the resident dolphins on a kayak in Cape Byron Marine Park and spot whales during their annual migration from a headland, kayak or cruise boat. Byron Bay also celebrates the arts. Each year some of the best musicians in the world perform in Byron Bay. Bluesfest is Australia’s premier blues and roots festival. Splendour in the Grass is an exciting mix of contemporary performers. And there are writers and film festivals. From verdant hinterland and sparkling beaches to acclaimed festivals and farmers markets, Byron Bay offers many exhilarating and delightful things to do and see. Explore the region’s enchanting towns, markets and boutiques, and unwind in the easy-going atmosphere. 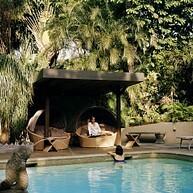 Byron Bay offers many natural and alternative therapies, from holistic remedies to spiritual readings. Pick up a copy of the Byron Body & Soul Guide from the visitor information centre to find natural and alternative treatments that appeal to you. The ocean around Byron Bay is home to a thriving underwater world. The Julian Rocks, just 2.5 km off the coast in Cape Byron Marine Park, is one of the best dive sites in the world to see fish and other marine life. Whales, dolphins, manta rays, leopard sharks, grey nurse sharks, and turtles are all common in the marine park, thanks to a unique blend of tropical warm currents from the north, with cooler temperate waters from the south. Sundive is Byron Bay's only PADI 5 Star Dive Centre. If you are not a certified diver, this is the place to train. A short scenic journey into Byron Bay's hinterland are private botanical gardens filled with extraordinary crystals and sub-tropical plant life. 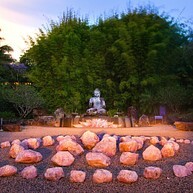 Walk among beautiful gardens and rainforest on the Buddha Walk, Rainforest Walk or around the labyrinth. The Peace Experience offers an enriching sound-healing bath, meditation session and Kora Walk around the Kalachakra stupa for world peace, a sacred monument that has been blessed by His Holiness the Dalai Lama. 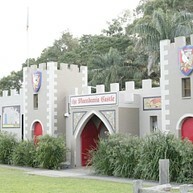 Fur, feathers, fine food and family fun - The Macadamia Castle is full of little surprises! There are lots of native furry friends and cuddly nursery animals, mini golf, train rides, playgrounds and barbecues. There's rabbit petting, face painting, a treehouse, and a reptile display including the local Brown Snake and Death Adder. All safe behind glass of course. Visit the crocodile exhibit and cuddle a croc. Treat yourself to breakfast or lunch with some great local coffee and delicious food. Enjoy pancakes, homemade cakes and cookies. Specialties include macadamia baked cheesecake and their famous beef burger infused with macadamia nuts. The Macadamia Castle offers a wide range of gourmet macadamia products and tastings of hot, roasted nuts. There's a fascinating gift shop and a full display of the macadamia nut industry. For half an hour or a whole day, The Macadamia Castle is a great place to visit! Ballina Naval and Maritime Museum is home to a stunning collection of history and memorabilia. These include the last remaining Las Balsas expedition raft which travelled from Ecuador to Australia forty years ago, the largest collection of ship models in Australia, rare and unique shipwreck items, and the fascinating history of the Port of Ballina. The museum features DVD showings and interactive displays - perfect for the kids - as well as plenty to keep the adults interested such as recreated scenes from naval vessels, a tribute to women in the navy, and an extensive collection of naval uniforms. Offering guided tours for large groups, a souvenir and gift shop, and open seven days from 9am to 4pm, why not take the time to discover the remarkable history of the Ballina area at the Ballina Naval and Maritime Museum. The Australian Seabird Rescue, Research, Rehabilitation and Coastal Education Centre in Ballina offers a comprehensive educational experience for people of all ages. Participants experience first hand the issues in their local environment. The interactive, hands on approach gives everyone an unforgettable experience that they can take home and share with others. All presentations include a one hour informative talk by one of their trained volunteers, as well as a chance to see wildlife that may be in their care. Animals that you may get the opportunity to get a close-up look at may include pelicans, other sea birds, shore birds, and even the fascinating and endangered sea turtles. Australia's premier blues and roots festival is held on the Easter long weekend each year, with up to seven stages and more than 200 performances by some of the best blues, roots, folk, soul and world music artists. The event is held on 120 hectares at Tyagarah Tea Tree Farm, just north of Byron Bay. Brunswick Heads is a beautiful coastal village on the mouth of the Brunswick River. About 15 minutes' drive from Byron Bay, this charming town is on the doorstep of many white sandy beaches such as Brunswick Heads beach, a popular spot for swimmers and anglers. With excellent boating and fishing, inviting pubs and cafés, and delicious fish and chips, the town is a delightful destination year-round.